I think I'm developing quite a reputation, and I need to try and change my ways. 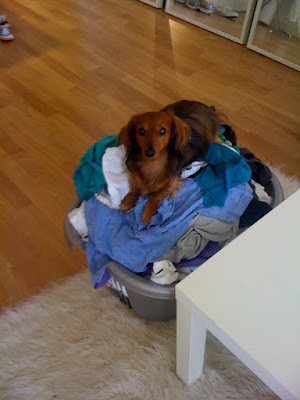 In order to help out around the house, I decided to assist Dad today with the laundry. w00fs, u soo helpful, cleaning out makeup and wiff the laundry..
Don't forget to separate the colours, darks and whites before you do a load. Oh, Chloe, you are very helpful! I'm sure everyone appreciated it and they are looking forward to your help on the rest of the chores. Hmmm, the only thing I like about laundry is crawling in it right after it comes out of the dryer. Oh, nice to meet you! I'm adding you to my "More Wiener Dog Blogs" blogroll and following you.